The NordicTrack Treadmill Desk is ON SALE! Treadmill desks are a hot commodity and a number of fitness equipment companies now offer them including NordicTrack with their original model called the Treadmill Desk. They also released a newer Treadmill Desk Platinum with a longer 18-60″ deck area. Now you have your choice of two models at two different prices. Treadmill desks make sense for individuals that have desk jobs that requires sitting for hours on end. You are putting yourself at physical risk. In fact, a recent article by the Washington Post lists the numerous hazards of sitting for extended periods of time. Some of the potential health risks include muscle degeneration, colon cancer, heart disease, poor leg circulation, disk damage, reduced brain function, and an over productive pancreas. To avoid these hazards, why not walk as you work? MID-WEEK SALE ENDS THURSDAY: The NordicTrack Treadmill Desk is priced at $999. Financing is available. Hybrid Walking and Sitting Design — What we liked most about the NordicTrack Treadmill Desk is that it can be used as a walking or sitting desk. In fact, the Treadmill Desk is one of the few models that offers this option. Steelcase offers this dual functionality but costs $5,049. With the NordicTrack Treadmill Desk, you can walk on the deck with the desk over it, or you can fold the treadmill deck, lower the desk and work as you sit. The desk can be adjusted 18” up or down. We always thought that one of the major flaws of the treadmill desk concept was that users were not going to work and walk for 8 hours or more. When you want to sit and work, you would require an entirely new work space. This is not an issue with the NordicTrack Treadmill Desk. 2.6 Continuous Duty HP Motor — The NordicTrack Treadmill Desk has a 2.6 CHP motor, which is more than sufficient for a walking machine. 18” x 55” Treadbelt — If you were planning on jogging or running on the NordicTrack Desk Treadmill you may find the belt size a bit short, but for walking it is more than sufficient. Reflex Cushion Deck — This machine has a standard cushioned deck. Nothing too fancy here. Integrated Desktop with USB Charging Station— There is a simple console that is built into the desk. There are buttons for controlling the speed and incline. The desk is built on a welded steel frame and is not attached to the treadmill deck in order to isolate any vibration from the deck. iFit Coach Ready — iFit Live is an option available on all NordicTrack treadmills. This innovative technology allows you to create custom workouts, store and track your stats, and simulate walking on popular terrains like National Parks. Click here to learn more about iFit Live. Which Treadmill Desk Model Should You Buy – Regular or Platinum? The Platinum model has an 18×60″ deck that will work better for taller users with a long stride. It also has a more powerful motor at 3.0 CHP instead of the 2.6 CHP found on this regular model. The regular model does not have an incline feature. If you are a tall person, the extra length on the Platinum might be enough to sway me in that direction. We also really like the incline feature available on the Platinum model. Even though you are walking and working, a steady incline can really ramp up the intensity and work your glute muscles. Still, if price is more of a consideration, you would be getting a great machine with the regular NordicTrack Treadmill Desk. Check out a complete comparison chart of NordicTrack models here. There are a number of companies offering less expensive versions of treadmill desks, but these are often cheap treadmills with an unstable desk. The treadmill decks tend to be more like the decks you would find on budget treadmills in Walmart or Target. The NordicTrack Treadmill Desk is a quality treadmill where they replaced the usual console with a desk and a built-in console. As mentioned, this is one of the few treadmill desks that configures for both walking and sitting. 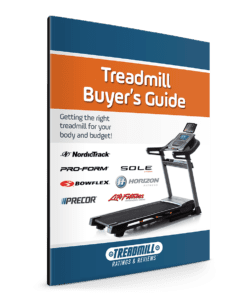 If you are sold on the health benefits of a treadmill desk, and there are many, the NordicTrack Treadmill Desk is one of the best options available.